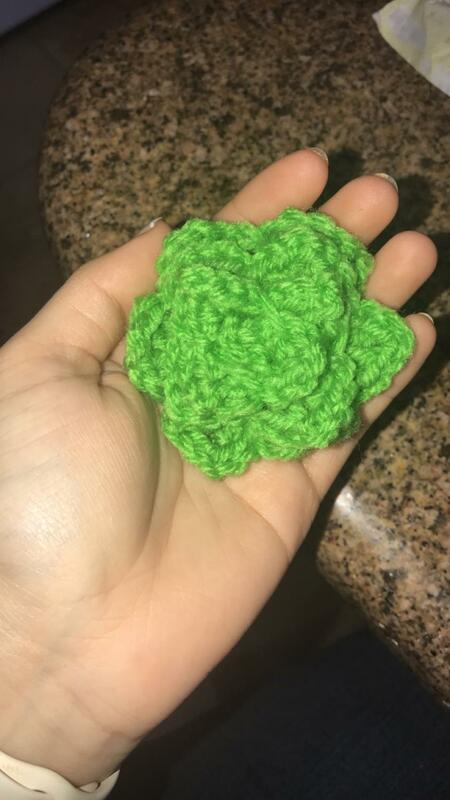 I love plants and I love crochet. When I found this free pattern on Pinterest I fell in love with it, so I decided to make them. This is my first time making these succulents, and I feel like they turned our great and they only took me 10 minutes total to do. First, chain (ch) 41, the pattern requires a multiple of 10, plus 1. If you want a smaller plant, you only chain 21 or 31 instead of 41 or 51 which gives you a medium sized plant. Then, single crochet (sc) into the second stitch, ch 2, skip a stitch and do that until the end of the row. Row 2: In the chain space, knot the chain, work two double crochet (dc), ch 2, 2 dc, ch 1 and slip stitch. This gives the pointed petal look. 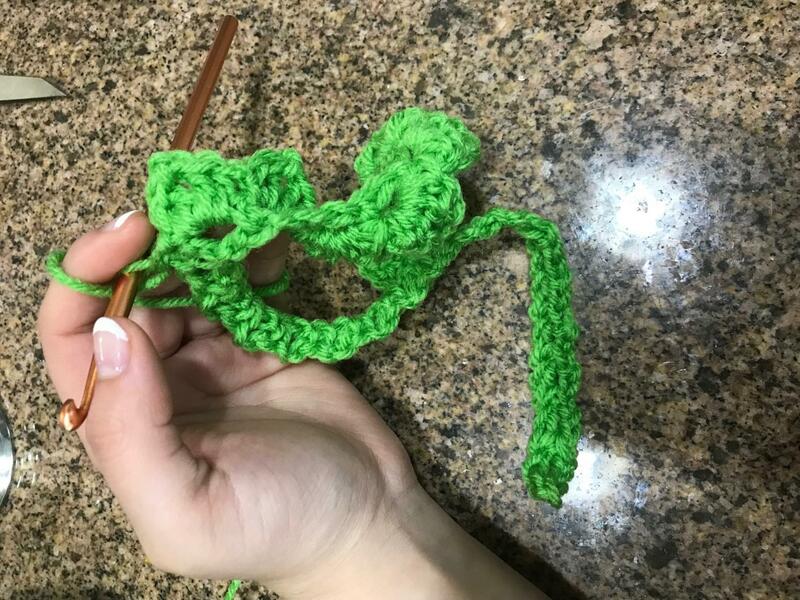 Do this about 1/3 of the way and then reduce to half double crochet (hdc) instead of dc. Then in the last three chain spaces, substitute hdc to sc. Leave a long tail for sewing the plant in a circular shape. 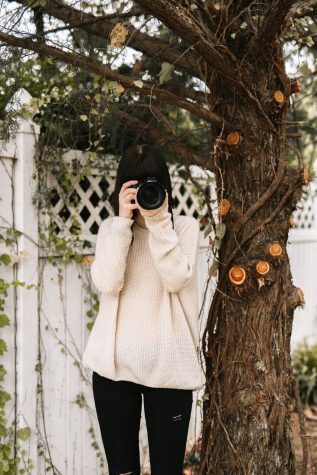 You just have to play with the look and the way you want the plant to look. I rolled mine as I went and pulled the petals and made sure they looked the way I wanted them to. The center has to be tighter than the outside because real succulents grow that way, they blossom out. I decided to go ahead and paint a mini pot for my little crochet succulent. I had a few spare flower pots in my greenhouse. I painted the pot all black then dabbed some violet and dark blue to make a galaxy and give depth. Then, I speckled white paint on the pot and honestly, got a little carried away on the stars. Now, I’ve finished my little succulent and flower pot. 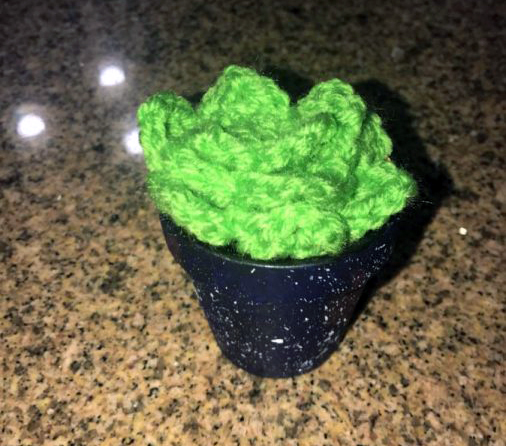 Enjoy your little crochet succulent and flower pot, just in time for Spring!